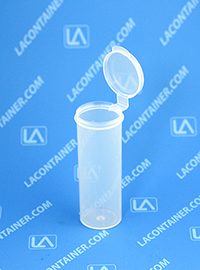 Lavials® VL21H Large Hinged-Lid Polypropylene Lab Vials. USA made from FDA compliant plastic. 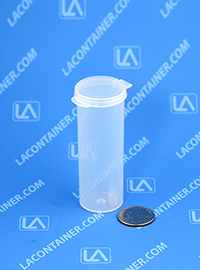 The Lavials® VL21H large hinged-lid lab vial is used in many industrial and laboratory applications due to its high quality design. Featuring an attached air and moisture resistant lid, this American made plastic vial can store art supplies, paint, or skin care products. Manufactured with medical grade polypropylene, the Vl21H can be autoclave sterilized and can safely contain medical supplies or dental products. 1.11" Dia. X 3.27" Ht. 33.78mm Dia. X 85.34mm Ht. 28.19mm Dia. X 83.06mm Ht.